We're ON Language...learn more about us here. GAINESVILLE, GA – ON Language learners, staff, faculty, and administration are mourning the unexpected passing of highly regarded and multi-talented teacher Lisa Maliska. Lisa joined ON Language in Gainesville in August 2018. Her gifts and experience in teaching, acting, directing, and caring for people impacted everyone with whom she came into contact. She was preparing to travel to Anhui Normal University in Wuhu, China to teach for ON Language beginning March 2019. Though Lisa had been a member of the ON Language team for less than a year, her pursuit of excellence, her excitement for life and her joyful, peaceful manner made an indelible impression on those she taught and with whom she worked. Learners in her classes and co-workers alike will greatly miss her. ON Language is making plans to honor the remarkable example and the memory of Lisa Maliska in coming times; specific information will be announced at a later date. Lisa’s family will host friends in her hometown of Hayesville, North Carolina tomorrow evening and then hold a private graveside service on Tuesday. Details and space for leaving condolences are available in the obituary posted here. She was exceptionally humble. Only time would reveal her many talents. She would only mention them if the context necessitated it, and if she was specifically asked about them. She always smiled, in her silence and when talking; and it was very genuine. She cared for students and people not to appear caring but because she actually cared. She devoted herself to listening and giving, not talking and taking. She was silently creative and independently strong. She deserved the word “beautiful” in its truest meaning. Lisa is a lifelong learner with many interests and gifts. She holds two Bachelors of Art degrees in Exercise Science and Theatre Arts as well as multiple teaching licenses. 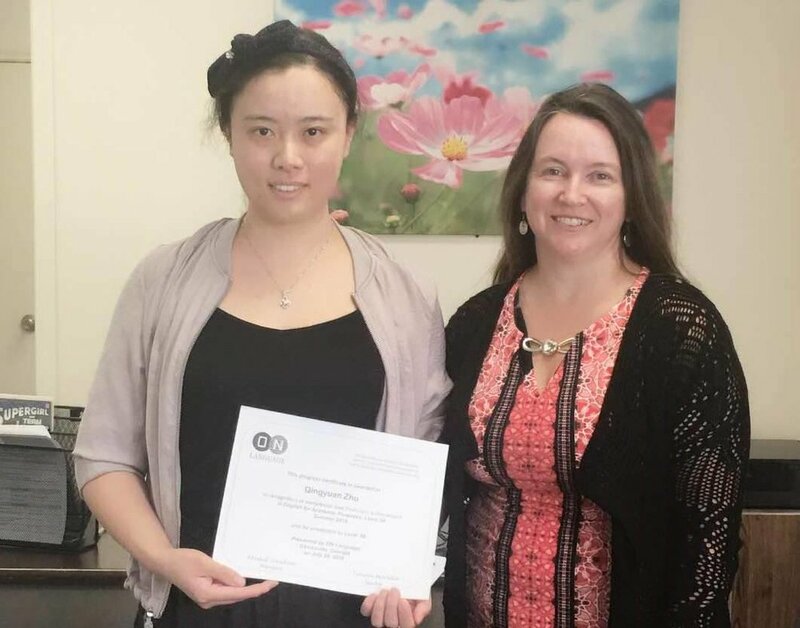 Previous to teaching in the US for five years, and with ON Language this year, Lisa taught English as a Second Language (ESL) and English Language Arts (ELA) and held administration positions for 7 years at Guangya School in Dujiangyan, Sichuan, China. She can speak, listen, read, and write Mandarin at an intermediate level and has a natural ear for languages. She is currently improving her Chinese skills and studying Spanish and French and mastering stage dialects in Irish, French, and RP. She hopes to one day earn an MFA in Voice Pedagogy with a focus on Shakespeare and classical text, with the dream of teaching Voice at the University level. Lisa’s interests outside of teaching are acting/directing, playwriting for TYA (Theatre for Young Audiences), carpentry, cultural and ethnic food, weight lifting, and mastering latte art as manager and barista at a local coffee shop. ON Language President Khalid Ibrahim proudly displays the institution's 5-year CEA initial accreditation certificate. GAINESVILLE, GA – ON Language, a private, post-secondary English language institution operating programs on the campus of Brenau University, earned the maximum possible five-year initial accreditation from the Commission on English Language Program Accreditation (CEA) this month. ON Language is accredited by CEA for the period August 2018 through August 2023 and agrees to uphold the CEA Standards for English Language Programs and Institutions. CEA is recognized by the U.S. Secretary of Education as a nationally recognized accrediting agency for English language programs and institutions in the U.S.
ON Language established and opened its corporate home in Columbia, South Carolina in 2015. The company opened its Georgia location in 2016, when it began operating on Brenau's historic main campus to serve international students and other English language learners living and working in the Gainesville/Hall County community. Khalid Ibrahim is President of ON Language and currently acts as the Center Director for the ON Language site in Gainesville. ON Language CEO Lenore Morales presently manages business and compliance for the company’s Gainesville site. “This decision is expected yet still very exciting,” said Ibrahim. “Having CEA accreditation will allow us to increase our global reach with our innovative, leadership-based English language instruction,” Morales said. ON Language offers its flagship intensive English program (IEP) at Brenau in five full-time and three part-time sessions per year. In addition to the IEP, ON Language offers custom courses in English for specific purposes, teacher training, online courses, English language tutoring, and summer camps for high school students. Business partners and long-time English language teachers and friends Ibrahim and Morales founded their educational company in South Carolina in 2015 with a commitment to quality English language instruction in a global leadership-oriented environment. All ON Language courses and programs include special emphasis on intercultural competence and leadership skills development. Ibrahim holds a master’s degree in English as a second language (ESL) and applied linguistics from Winston-Salem State University and is nearing completion of a doctoral degree in teaching English to speakers of other languages (TESOL) at Anaheim University. Morales has a TESOL master’s degree from Greensboro College and is in the final stages of a Ph.D. in global leadership and organizational management at Indiana Tech. CEA standards “comprise 44 individual standards in 11 standards areas. They were developed initially by a committee that took into consideration the various English language program standards that existed in the United States, Canada, the United Kingdom, and Australia,” according to the agency’s official website. ON Language offers intensive and custom, face-to-face and online English language instruction for international students, immigrants to the U.S., and business employees. The company operates administrative offices and student services and instruction on the main campus of Brenau University in Gainesville. Interested individuals and organizations may contact ON Language at ask@onlanguage.net or 770-297-5862, or visit the website at www.onlanguage.net. ON Language was delighted to have John McDowell as the Spring 2018 curriculum development intern as part of the ON Language TESOL Graduate Student Practical Internship program. John, who is studying in the TESOL master's program at Georgia State University, worked with ON Language President Khalid Ibrahim to research and develop lessons for delivery in the ON Language intensive English program (IEP). John was able to incorporate his ON Language internship work into assignments for his Georgia State applied linguistics course. ON Language TESOL intern John McDowell is shown with EnglishUSA Executive Director Cheryl Delk-LeGood at the IEP Mini-Conference, hosted by the University of Georgia in Athens, on February 24, 2018. In addition to the curriculum development portion of the internship, John also attended the EnglishUSA IEP Mini-Conference in Athens, Georgia for ON Language on February 24. He attended several sessions at the conference, met several IEP-related professionals, and brought valuable information back to ON Language. "The conference was a blast, and I learned so much," John reported after his day with fellow IEP representatives. ON Language will continue to offer its TESOL Graduate Student Practical Internships to provide opportunities for developing English language teaching professionals. TESOL interns may work from a distance or at the ON Language location at Brenau University in Gainesville, Georgia, depending upon the project focus. Visit http://www.onlanguage.net/tesol-graduate-student-practical-internships to learn more and apply! ON Language now accepts sponsors to provide tuition support for learners. Learners who need tuition support can now request sponsorship within the ON Language application. Sponsorship funds, as available, are applied on a first-come, first-serve basis for accepted students enrolling at ON Language. ON Language unveiled its innovative, flexible, and enriching TESOL Graduate Student Practical Internships in 2017. Graduate students studying in TESOL may apply for face-to-face, distance, or hybrid internships to complement their studies with practical, hands-on experience in English language teaching and program administration in the IEP context. ON Language supports freedom of travel according to U.S. laws already in place and official guidance and application already in practice prior to President Trump's executive order on extreme vetting. ON Language welcomes learners of all nationalities and ethnicities in its programs, and encourages our government to return to welcoming all people of demonstrated goodwill to visit, live in, and travel to and from the U.S. without hindrance or unfair treatment. Further, ON Language provides tuition waivers and discounts for learners who hold refugee status within the United States; learn more at http://www.onlanguage.net/admission/. Summer 2016 - CONGRATULATIONS TO OUR LEARNERS IN GAINESVILLE, GEORGIA! Left to right: Thiago Feriani, Teacher Khalid Ibrahim, and Murilo Montemor. Left to right: Qingyuan Zhu and Teacher Lenore Morales.